Click here to preview the included Tech Packs for Womens, Mens, Plus Sizes and Childrens specs!! Learn apparel industry terminology for common points of measure. “Do you know how to measure garments? is a question that usually comes up during apparel design job interviews, especially for entry-level or assistant fashion design positions. Whether you’re trying to land your first job in the fashion industry, or you’ve already been an apparel designer for years, learning how to measure clothing is one of most important skills a fashion designer can have. 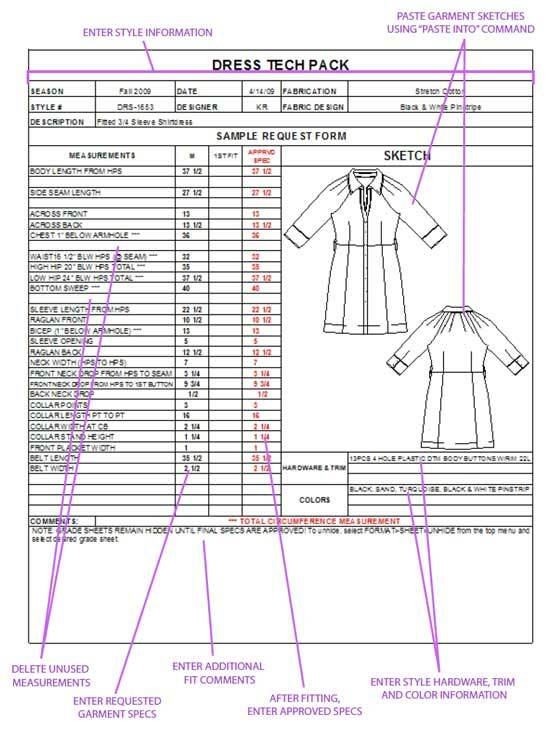 Apparel designers need to include at least basic garment measurements with their flat sketches, and Senior Designers must review and approve the garment specs as well as train other designers how to measure clothing. Even though “specing” garments is a fundamental task in the apparel industry, many fashion schools don’t focus on this skill nearly enough. If an employer doesn’t have to train you how to measure clothes on the job, you’re more likely to get the position (and get paid more too). Our “How to Spec a Garment” eBook, will prepare you with the fundamentals you need to spec any type of garment. You’ll become familiar with common points of measurement (POM) for apparel, giving you the skills and confidence you need to stay ahead in the competitive fashion industry. Since there is no universal standard when it comes to measuring garments, each company has their own system for specing garments. This tutorial will leave you with the ability to easily adapt to various company standard measurements and points of measurement. Even after you learn how to measure clothing, this eBook serves as a handy reference in fashion school, or throughout your apparel design career. If you already know how to spec a garment, you can buy the tech packs separately. Wow!!! This is amazing! This is exactly what I’ve been searching for. I am applying for a design position that now requires one to know how to spec garments. This is perfect!!! It has everything that one needs to know.